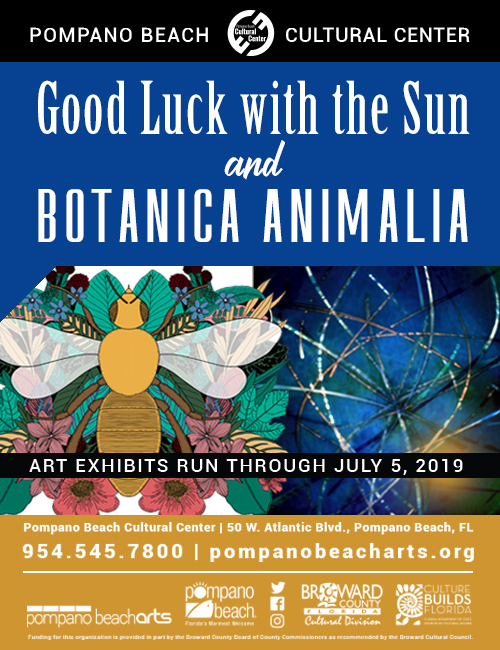 Two Exhibits At Pompano Beach Cultural Center, “Good Luck With The Sun” And “Botanica Animalia” Opening Reception Tomorrow. Exhibits Run Through July 5. Stop by the Pompano Beach Cultural Center and see two exhibits “Good Luck With The Sun”, photography by internationally renown artist, Krista Steinke and “Botanica Animalia”, by Catalina Villegas, showcasing lively illustrations of the natural world. Enjoy the free, Opening Reception and meet the artists on Friday, April 12. The Rickie Report shares the details and some sneak peeks. These exhibits will be available through July 5. “Good Luck with the Sun” showcases the photography of internationally renowned artist Krista Steinke as she explores how the natural world impacts our lives in ways both obvious and mysterious. 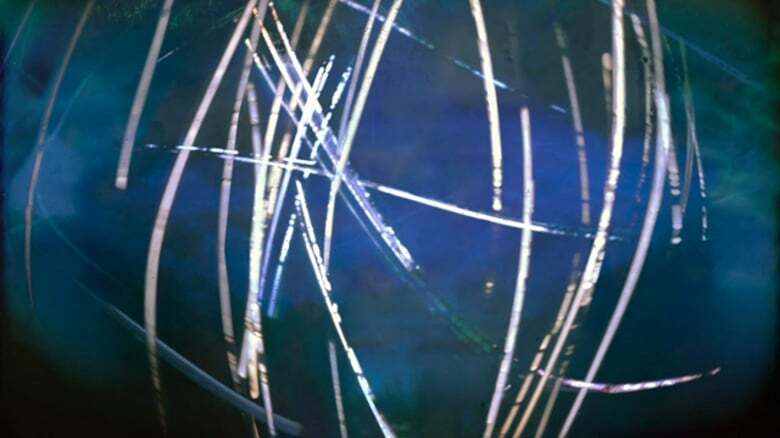 Using pinhole cameras, homemade filters, and other experimental techniques, she draws meaning from her materials and process, often working at the intersection of abstraction and photographic recording. Referencing varied sources such as art and photographic history, scientific areas of study, current events, and personal experience, her work sets out to reflect on the universalities that shape the human condition while also calling attention to critical issues surrounding the environment. Steinke has exhibited and screened her work in museums, galleries, and film festivals across the country, as well as internationally. Her works are represented in public and private collections, including the Museum of Fine Arts, Houston, Woodmere Museum in Philadelphia, the Brauer Museum of Art, Atlanta International Airport, Johnson & Johnson Corporation, and Fidelity Investments, among others. She is the recipient of a Pennsylvania Council on the Arts Fellowship, a grant from the Puffin Foundation, an Artist Residency at Light Work, a Promise Award from the Sustainable Arts Foundation, and most notably, a Fellowship in Photography from the Howard Foundation. She has participated in several photo festivals and conferences either as an exhibitor, speaker, or curator, including The International Digital Media and Arts Association (iDMAA), Denver Month of Photography, Fotofest, The Invision Photo Festival, and Society for Photographic Education. “Botanica Animalia” by Catalina Villegas is an exhibition of lively illustrations of the natural world. 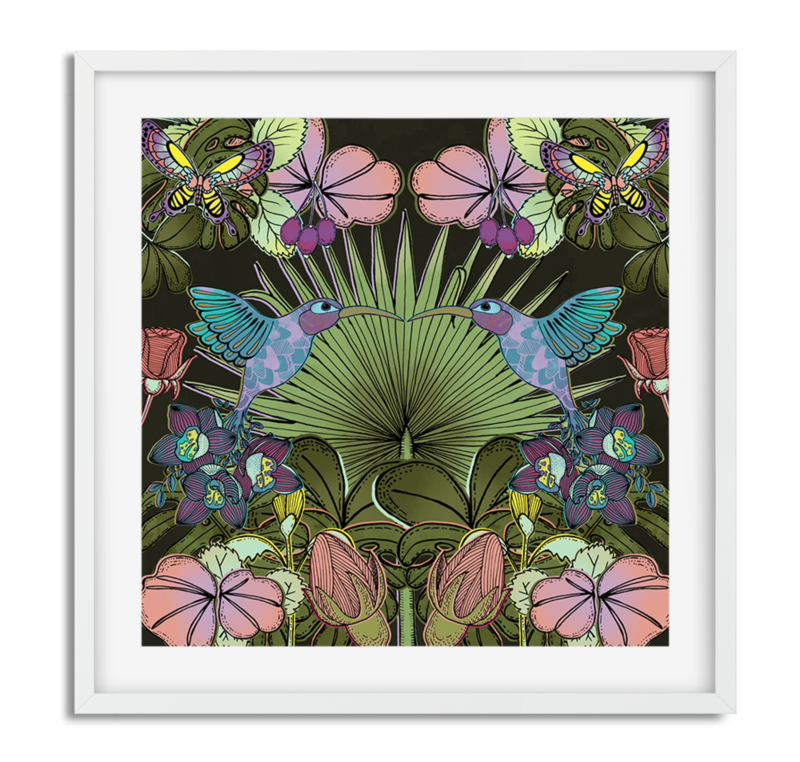 Featuring buoyant images in black and white, which transition into colorful flora and fauna, her work is a vibrant homage to the living things all around us. Villegas was born in Medellin, Colombia and was raised in Miami, Florida. She is an illustrator and surface pattern designer who grew up drawing and painting all of her favorite plants and animals. Her work focuses on exploring the vast diversity of lush flora and fauna found in Colombia and Florida. She has made her life’s purpose to be involved in creative endeavors. Her travels and professional adventures have given her the opportunity to work as a graphic designer for a Colombian menswear line, a freelance photographer in South Florida, and as an illustrator for clients around the world. Her work has been published in various magazines and blogs including WeTransfer.com and UPPERCASE Magazine. She licenses her art to companies that make a range of products including temporary tattoos, seed packets, home decor items, gift wrap and fabric. Villegas studied Fine Arts at Florida International University and has completed numerous courses with renowned international art agent Lilla Rogers (Make Art That Sells) and Rachael Taylor (Make it in Design). She has a love for bass guitar, heavy metal, hula-hoops, chai lattes and chihuahuas. She plays the bass in an all-female rock band called Lilith. Catalina currently divides her time between La Ceja, Colombia, and Pompano Beach, Florida.